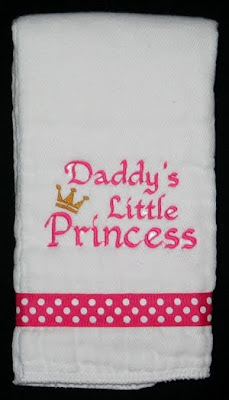 Melanie requested a couple burp cloths for her niece. 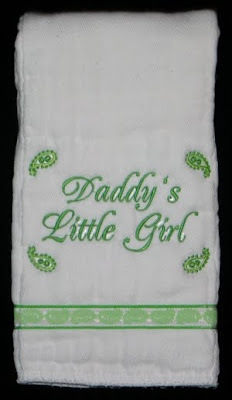 "Daddy's Little Girl" is stitched with Embird Alphabet #38, and I added paisley designs (from a frame from AK Designs Boutique) to go with the ribbon. 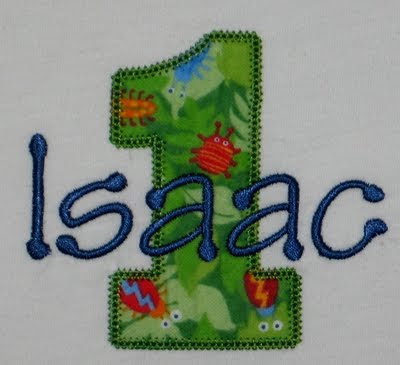 While doing a search for 1st birthday shirts with a bug theme, Christi stumbled upon the shirt I stitched for Will in July. 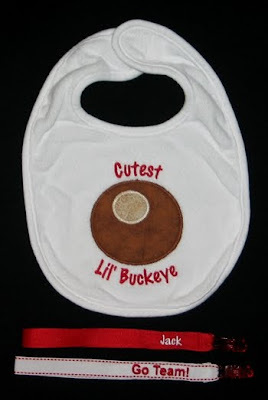 She contacted me about making one for her son Isaac, and I was happy to oblige! 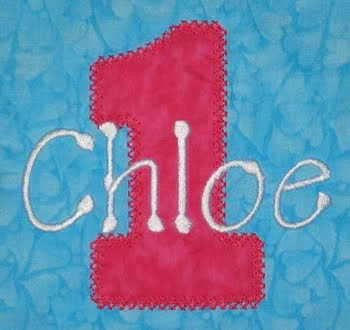 The "1" is from Chubby Wubby Applique Numbers from GG Designs, and the font is Tinker Toy from 8 Claws and a Paw. A special little friend of mine turned one this week. Her mommy wanted something special to wear both on her birthday and at her party. She did some internet searching and found a couple precious outfits, but one was over $80! She figured I could come up with something, so we got to work. 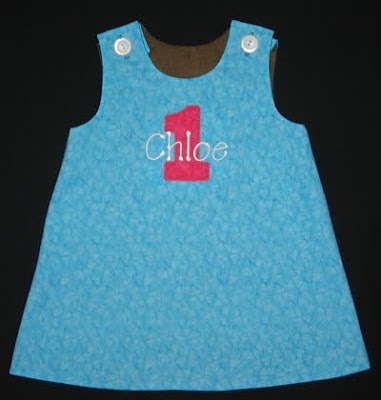 We quickly settled on a reversible A-line dress (Martha Pullen, size 1), with two different applique designs. 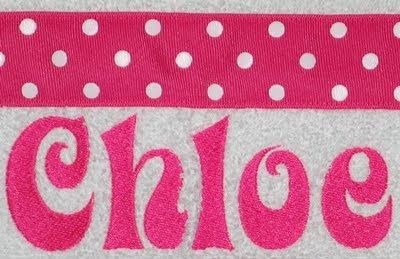 Jenn bought the fabric, ribbon and buttons, then came over and we picked out applique fabric and threads together. 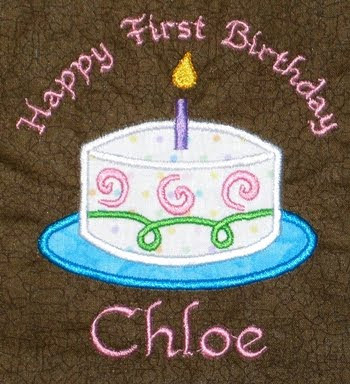 The applique cake is from Lynnie Pinnie. I added the text with Embird Alphabet #33. I had my camera with me both Wednesday and today, but failed to take pictures of Chloe, mainly because it's hard to do while holding Dashiell. BUT our mutual friend Glenda took pictures of Chloe this week. You can see a preview on Glenda's Photography blog, and later next week I'll add a few of Glenda's shots to this post so you can see how precious Chloe looks in her dress! 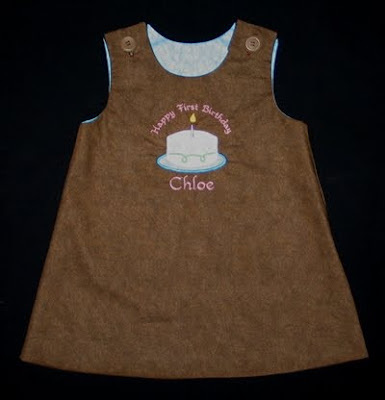 I spent so much time thinking about the dress Jenn asked me to make for Chloe's party that I nearly forgot to make a birthday present! 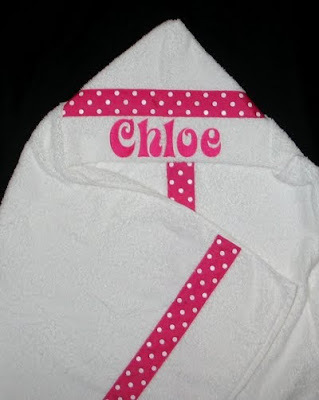 Thankfully I had everything I needed for a hooded towel, and got to work a mere 24 hours before her party. I guess I haven't made a hooded towel since before Christmas... crazy! Thankfully I remembered how :) and this one turned out very cute! I used the Elle alphabet from 8 Paws and a Claw. 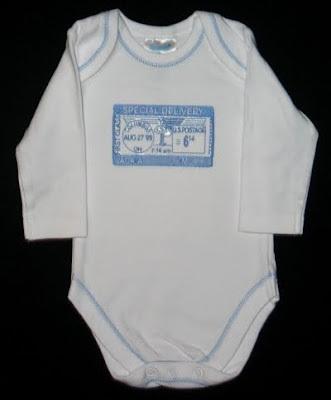 Rosanne contacted me about a couple baby gift orders. 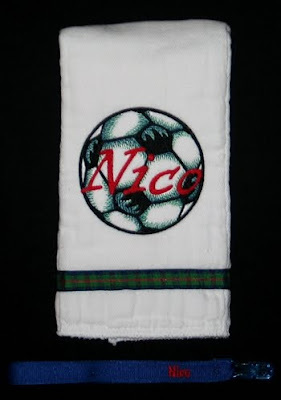 Nico's daddy likes soccer and Scotland, so Rosanne suggested a soccer ball and plaid ribbon. I've had this soccer ball design from Embroidery Library for a while, but hadn't stitched it out yet. 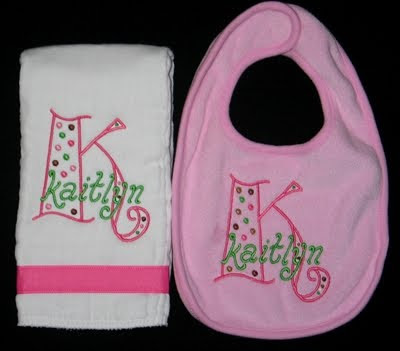 (I LOVE their Simple Treasures designs!!) Instead of stitching it in three shades of gray/black, I decided to use green and blue for the shading to coordinate with the ribbon. Nico's name is stitched with Indie font from 8 Claws and a Paw. 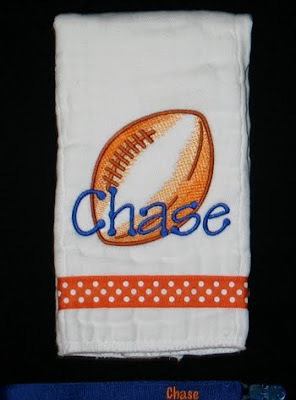 For Chase's burp cloth, Rosanne requested a UF Gator motif/colors including a football. Originally I suggested a stacked monogram in orange and blue with football ribbon or my usual applique football with "Daddy's Little Gator". But after doing Nico's design, I realized I could do the same thing with EL's Simple Treasures Football. I used a couple shades of orange for the shading and blue for the text. I picked Tinker Toy from 8 Claws and a Paw to coordinate with the polka dots on the ribbon. 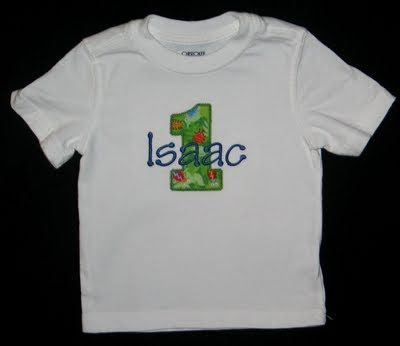 Tiffany requested a shirt for a special little friend who is turning one. 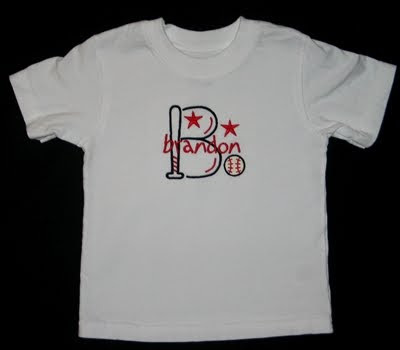 His parents are big baseball fans, so she suggested the baseball monogram from Five Star Fonts. Daddy is a Reds fan, Mommy is a Cardinals fan, so we went with red and black. 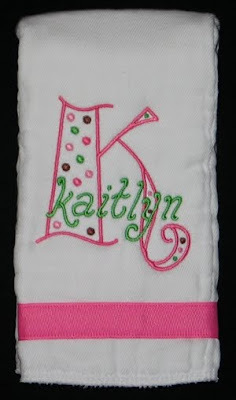 The monogram is from the Dot Alphabet at Julia's Needle Designs, and "kaitlyn" was added with Five Star Font's Whimsy Alphabet. 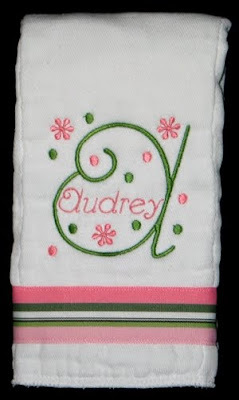 I also stitched another burp cloth for Tracy's daughter, Audrey. 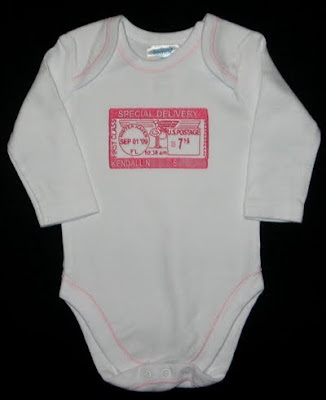 The monogram is from the Rhumba set available at Sew Crazie Designs. So you are probably thinking what I was thinking: with Annaliese in kindergarten all day Janay is going to be doing even more stitching than ever! New blog post every day, right?? (1) Dashiell decided to pull to standing on Annaliese's first day of school. Since then he has started cruising around furniture. All he wants to do is stand. He is no longer content to play in the exersaucer or pack-n-play for a significant amount of time. I'm not sure how I'm going to get anything done ever again. (2) Carlin's been coughing for over 5 weeks, and I'm starting week 3 of my cough. Found out Friday that I tested positive for pertussis. LOVELY. So my cough most likely will just get worse with more whooping over the next few weeks. Almost done with antibiotic so I'm not contagious. But if you haven't gotten your booster in the last 10 years, consider requesting that at your next appt. This is not fun. SO... I haven't done much stitching since my last post. Just a few small things here and there. I made a small contribution to a cute ensemble. 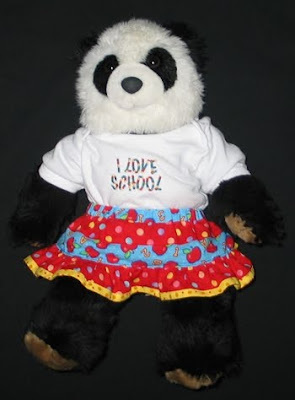 Kathy made Annaliese an "I LOVE SCHOOL" shirt. My mom also wanted to make something special for the beginning of school, so I suggested a coordinating twirl skirt. 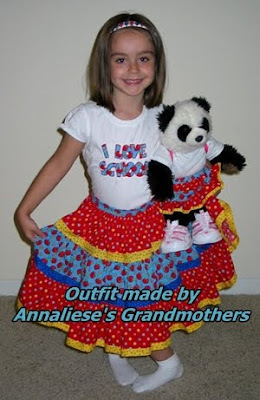 Kathy shared her leftover fabric, and Mom made a skirt for Annaliese and her bear April. You can see that April is wearing a plain shirt in the picture, and that just can't be. 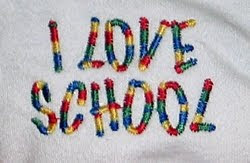 So I stitched "I LOVE SCHOOL" on a onesie for April. 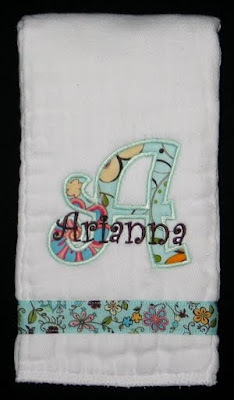 It was too small to do an applique like Annaliese's. I used Embird Alphabet #8, rotating the letters to imitate the original design. We couldn't decide what thread color to use, and settled on the variegated one. 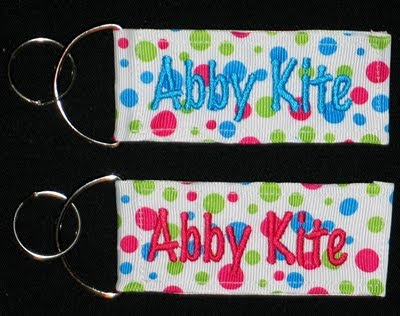 Rebecca asked for a couple keychains to attach to her daughter's backpack and lunchbox to label them. 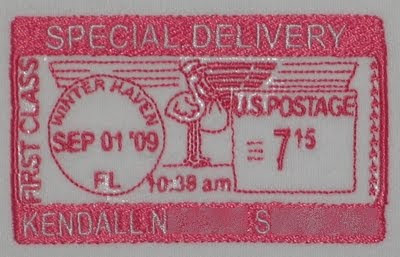 The benefit is they can be removed and attached to new items in the future! 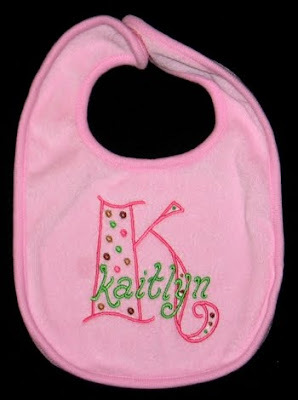 I used Embird Alphabet #8; couldn't decide between pink or aqua thread, so I did one of each. I actually did a little something for myself, too. I need my license when I go into Annaliese's school, and it's such a hassle to carry my purse around and dig it out of my wallet while holding Dashiell. 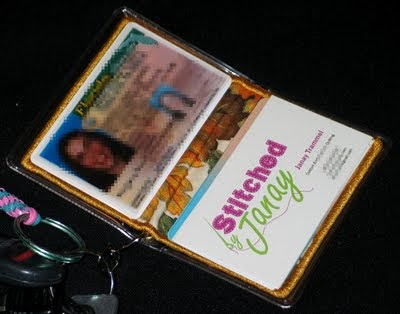 So I finally stitched an insert for a Vinyl Debit Card holder that Kathy gave me a long time ago. 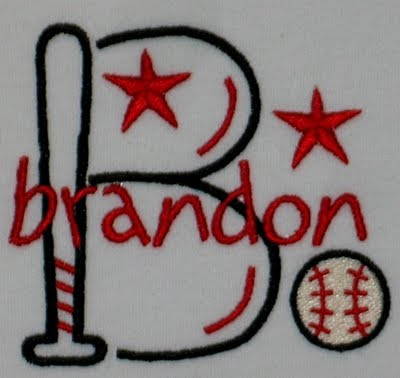 The insert design is from Embroidery Garden, the "J" is Empire font from Embroidery Arts. 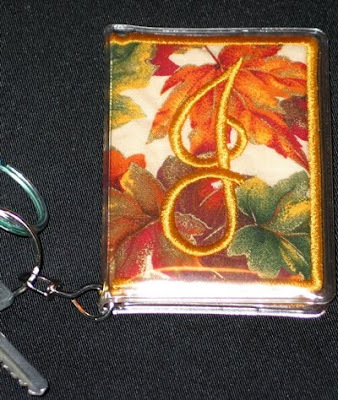 I chose the material and thread to match the fall purse I made last year. Ok, hopefully it won't be 2 weeks before I post again.